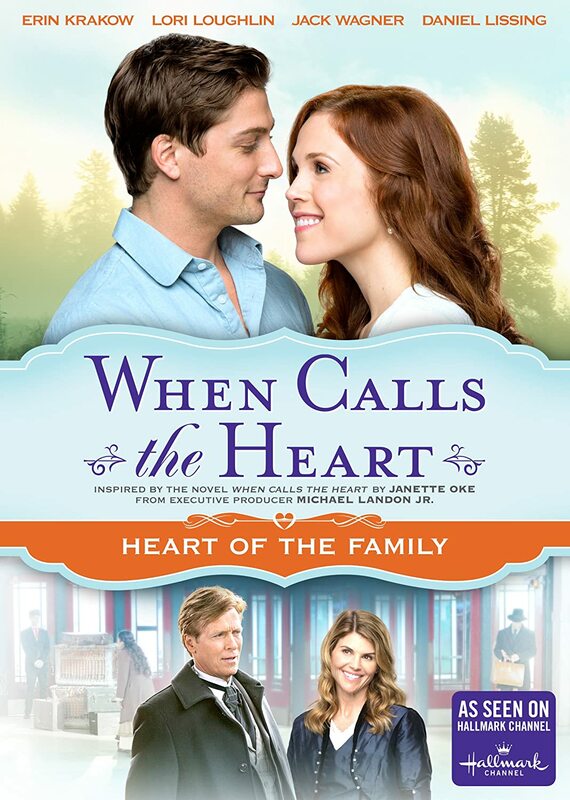 This Christian DVD is the third DVD of those that encompass the whole second season of the Hallmark Channel original series When Calls the Heart. You may have heard of this period time phenomenon. It’s such a great TV series to watch not only because of the phenomenal actors involved (for example Lori Loughlin, Erin Krakow, Daniel Lissing, etc.) but also because of the values and morals it represents. A wonderful resource to watch with your whole family! In Season 1 of When Calls the Heart we met the characters from Coal Valley (now Hope Valley) and fell in love with who they were and what they represented. Now in season 2, we get to know these characters more deeply, like for example, during this season we go to Hamilton, where Elizabeth grew up and get to see that part of her life that we didn’t necessarily see during season 1. The Christian DVD When Calls the Heart: Heart of the Family begins and we see Clara Stanton who actually was married to Abigail Stanton’s son Peter before he died in the mine disaster presented in season 1. She is now in town and here she meets a young man named Luke McCoy, who is new into town since his dad moved his family to make it possible for him to work at the lumber mill. Immediately Luke takes a liking towards Clara and is quite smitten with her but the conversation is a bit awkward. Although Luke gets the courage and asks Clara to an ice cream social that is happening very soon in town. Even though Clara is so flattered by this invitation, she refuses and leaves without explanation. What will happen here? Also in this Christian DVD, Jack Thornton and Bill Avery happen to have a conversation about some counterfeiters. Jack has received news that there may be some counterfeiters in town and he’s sure to ask Bill if this is the reason why he’s back in town. Bill hadn’t been back since he and Abigail had had a really big fallout and now he was quite uneasy about the situation. We can’t forget about Lee and Rosemary, huh? So Rosemary has been dying to have a theatre in town since she first arrived. Now she’s trying to convince Lee to build a theatre. She reassures him by saying that the town needs it (not as much as she does though). But at first, Lee is too focused on his new business venture and quite frankly doesn’t have the time to also add “build a theatre” in his schedule. He doesn’t consider it as important as Rosemary does. Remember what happened between Luke and Clara? Well, she explains what happened to Elizabeth and Abigail but Abigail is troubled when listening to Clara’s rejection to Luke’s invitation. Abigail is afraid Clara has rejected another chance at love because she is still holding on to Peter’s memory. Abigail from the Christian DVD When Calls the Heart: Heart of the Family visits Pastor Frank to hear his opinion and he’s sure that Peter’s memory is not what’s holding Clara back, he’s sure it’s Abigail herself. Clara just doesn’t want to disrespect Abigail by going out on dates again but Abigail lets her daughter-in-law know that she understands that she has to move on and continue her life. What is Elizabeth up to, you ask? Well, Elizabeth still is a teacher and low and behold she receives a visit from Charles Kensington, Elizabeth childhood friend. She is, of course, curious as to why he’s in town but he reassures her that is because of business but she’s not quite sure of that. Suddenly Lee calls out Charles’ name and it turns out Elizabeth’s dad’s company is actually one of Lee’s most important contracts. As Elizabeth hears this of her father, she is sure that Charles arriving in town didn’t occur by accident. Charles continues to spend time with Elizabeth and his desire of seeing her back in Hamilton and have her teach there is something he continues mentioning throughout his visit. But Elizabeth continues to stay strong in the fact that her heart is in Coal Valley/Hope Valley and she plans to keep teaching there. Now, what will happen between Clara and Luke? What about those counterfeiters mentioned by Jack and Bill? Are they in town? What will happen between the love triangle between Jack, Charles, and Elizabeth? You have to purchase the Christian DVD When Calls the Heart: Heart of the Family to find out!